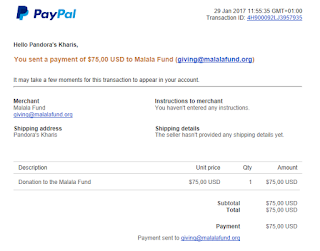 We are proud to announce that Pandora's Kharis members have come through for the Malala Fund! Together, they have raised $ 75,- to help support this very worthy cause. Thank you very much! Malala Fund wants to see a world where every girl can complete 12 years of safe, quality education. They advocate—at local, national and international levels—for resources and policy changes needed to ensure all girls complete 12 years of school. They invest in developing country education leaders and organisations — the people who best understand girls in their communities—in regions where most girls miss out on secondary education. They amplify girls’ voices. Malala Fund believes adolescent girls should speak for themselves and tell leaders what resources they need to learn and achieve their potential. From this moment on, the Pandora's Kharis Facebook page is open to pitches. If you do not have Facebook, feel free to pitch your cause in the comments. We will relay the message to the community. Please pitch your cause before February 7th. On to another month of pitching, voting, and giving! 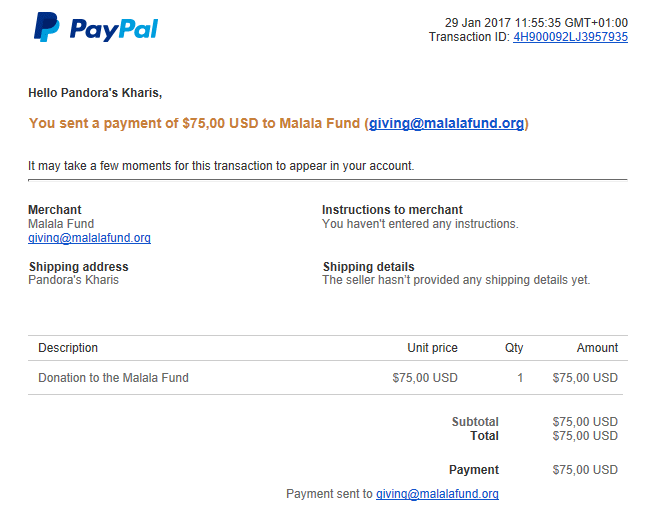 We are very proud to announce that The Malala Fund has become Pandora's Kharis' Gamelion 2016 cause. Malala was born on 12 July 1997 in Mingora, a town in the Swat District of north-west Pakistan, the country which has the second highest number of out of school children in the world. Like her father, she became an outspoken opponent of Taliban efforts to restrict education and stop girls from going to school. She is best known for the Taliban attack on her life. On 9 October 2012, as Malala and her friends were travelling home from school, a masked gunman entered their school bus and asked for Malala by name. She was shot with a single bullet which went through her head, neck and shoulder. Malala survived the initial attack, but was in a critical condition. The Taliban's attempt to kill Malala received worldwide condemnation and led to protests across Pakistan. In the weeks after the attack, over 2 million people signed a right to education petition, and the National Assembly swiftly ratified Pakistan's first Right To Free and Compulsory Education Bill. Malala became a global advocate for the millions of girls being denied a formal education because of social, economic, legal and political factors. In 2013, Malala and Ziauddin co-founded the Malala Fund to bring awareness to the social and economic impact of girls' education and to empower girls to raise their voices, to unlock their potential and to demand change. The deadline to donate is January 28th, 2017. You can do so by using the PayPal option to the side of the Pandora's Kharis website or by donating directly to baring.the.aegis@gmail.com. Thank you in advance!